The Post competed with the other daily newspapers in the Bay Area including the Chronicle and Mercury News for work in 2017. The 41st annual awards were presented at a banquet in Burlingame on Nov. 15, 2018. 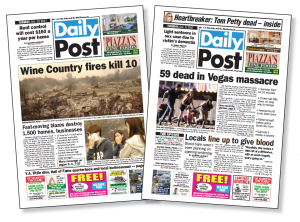 The Post won two awards for front page design in the San Francisco Press Club’s Greater Bay Area Journalism Contest.